The ‘Magistrala’ or Slovenian ski touring Haute Route is a superb experience and endurance test in the snowy embrace of Triglav National Park far away from the hustle and bustle of life. It’s just you, your skis, and a somewhat heavy rucksack! A three-day (or optional extended four-day) ski touring traverse of the Julian Alps from Vogel to Komna, through the Seven Lakes Valley, across Hribarice and Velo Polje, past Kredarica and the former Triglav glacier down to the Krma Valley. Priceless! The Triglav ‘Magistrala’ (meaning highway) ski tour is the only multi-day ski tour in Slovenia. Every ski tourer should experience it at least once in their lifetime. Day 1: Cable car to Vogel ski resort – Vogel 1,510m – Šija 1,880m – Zadnji Vogel mountain pasture 1,424m – Konjsko saddle 1,782m – beneath Podrta Gora 1,850m – Govnjač mountain pasture 1,474m – Dom na Komni mountain hut 1,520m. The tour takes from 6 to 8 hours. Day 2: Dom na Komni mountain hut 1,520m – Čelo 2,232m – Lopučnica 1,550m – Koča pri Sedmerih jezerih mountain hut 1,685m – bivouac na Prehodavcih 2,070m. The tour takes from 8 to 10 hours. Day 3: Bivouac na Prehodavcih 2,070m – Kanjavec 2,568m – Hribarice 2,358m – Velska dolina 1,750m – Bohinjska vratca 1,973m – Krma 980m. The tour takes from 6 to 8 hours. 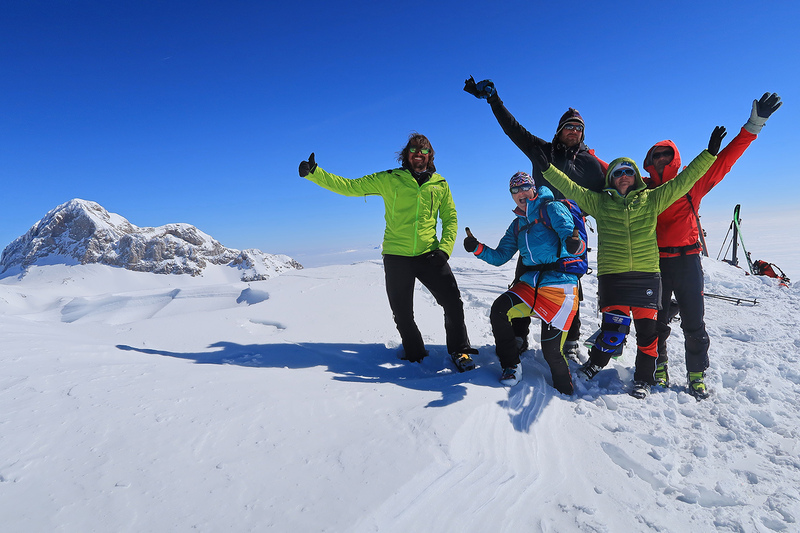 Extended 4 day Triglav ski traverse with Triglav summit climb or just an ascent up to Kredarica followed by skiing down to the Staničev dom mountain hut and further on to the Krma or Vrata valley. Price: includes guiding, equipment hire (not ski equipment), transport, ticket for cable cars, halfboard at Komna hut + food and drinks and bivouac at Prehodavci and costs for guide. Participants are eligible to receive a 15% discount on our ski servis.